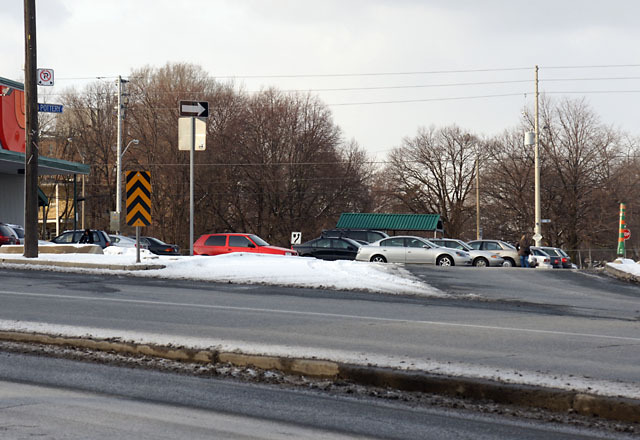 Notes: Following Pottery Road’s entire original route requires crossing busy roads mid-block. If you’re uncomfortable with this, you can always walk to one of the nearby intersections. There’s also one railway crossing which may or may not be legal to use: it’s at an old road allowance that is almost certainly still open, but that doesn’t mean that the crossing is still legal. The Cudmore Creek walk at Lost Rivers offers an alternate route for this section that skips the railway crossing, but takes you away from Pottery Road for a short distance. The walk also includes a couple of steep climbs or descents and some very rough ground; it can be done in running shoes, but you’d probably be happier wearing a pair of hiking boots with some ankle support. 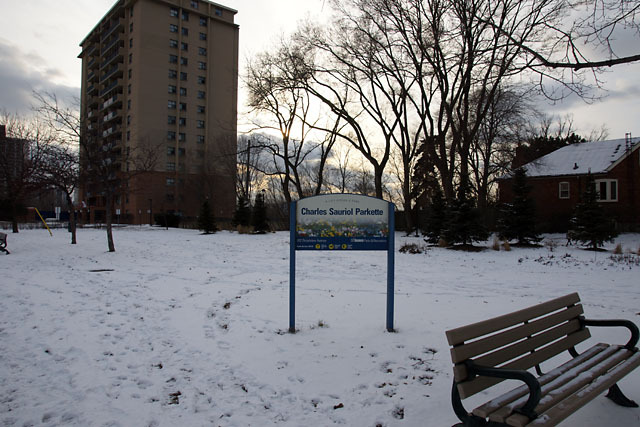 Start your walk at the sign (above) in the Charles Sauriol Parkette at the intersection of Hillside Drive and Broadview Avenue, a couple of hundred metres north of the current intersection of Broadview & Pottery Road. 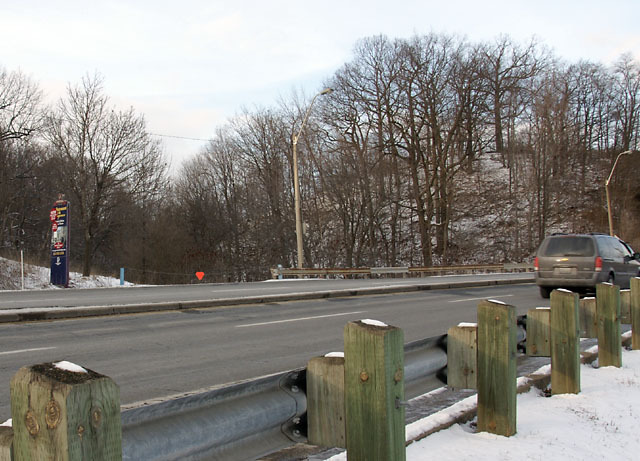 Pottery used to descend into the valley from here before it was moved south in the 1960s to make the hill more manageable for increased automobile traffic. Looking south in the parkette, you’ll notice a line of hydro poles going to the back of the park between the apartment building on the left and house on the right; they mark the former location of the road. Follow them down the hill to the current Pottery Road. Once at the road, you’ll need to cross to the path on the other side. Watch for traffic. Walking down the path beside Pottery Road to the valley floor, you’ll pass Todmorden Mills on the left and Fantasy Farm on the right. 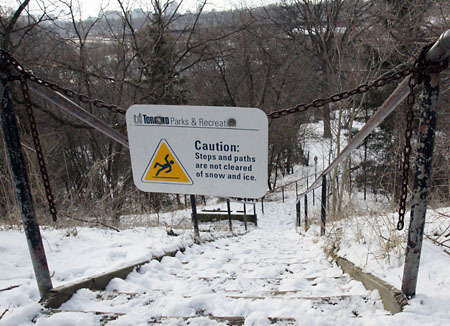 Despite being part of the Don Valley Hills and Dales (map—PDF) Discovery Walk, the stairway (left) into Todmorden Mills is chained off for the season because the city of Toronto doesn’t believe in any kind of winter maintenance for anyone who doesn’t happen to be in a car. Fantasy Farm used to be a working farm—pictures in the Toronto Archives show cows grazing on the hillside above Pottery Road. After you walk under the DVP, you’ll need to cross Pottery Road once more to get back to the north (or east, depending on how you’re orienting yourself) side to cross the bridge. Walk across the bridge and the railway tracks, but when the road ducks south to meet Bayview, you can just continue west, clambering up the embankment to Bayview. You should see the chained-off entrance to old Pottery Road (above) across the street. If you’re not comfortable crossing Bayview, cross at the intersection instead. Watch out for the old guy with the crutch. This portion is apparently used as an access road by Toronto Water and is maintained with a loose gravel surface. 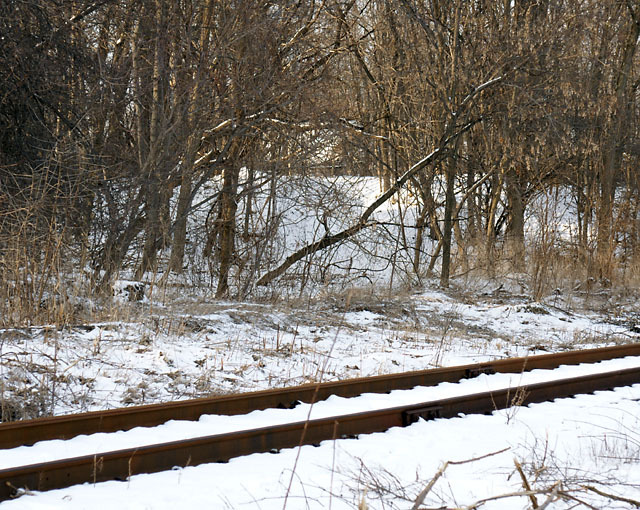 The wide roadway first swoops deeper down into the Don Valley, then heads northwest, climbing up toward the CP tracks. Cudmore Creek is on the right. 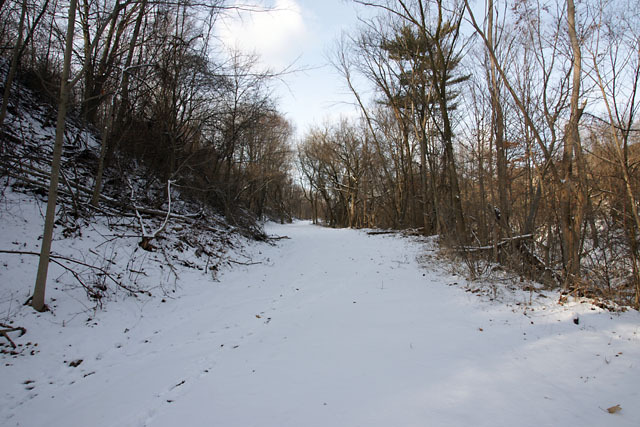 The old roadway is considerably more overgrown on the other side of the tracks (above), but the clear route through the center of the growth is still quite obvious, especially in the winter. Even 50 years of natural regeneration hasn’t managed to completely obscure the route. Scramble up the hill and you’ll see a short portion of the original alignment still in use as True Davidson Drive just south of Nesbitt Drive. This area was home to the infamous Bayview Ghost before its recent makeover into an entirely different kind of ghost development. This section continues across Nesbitt into a small park. 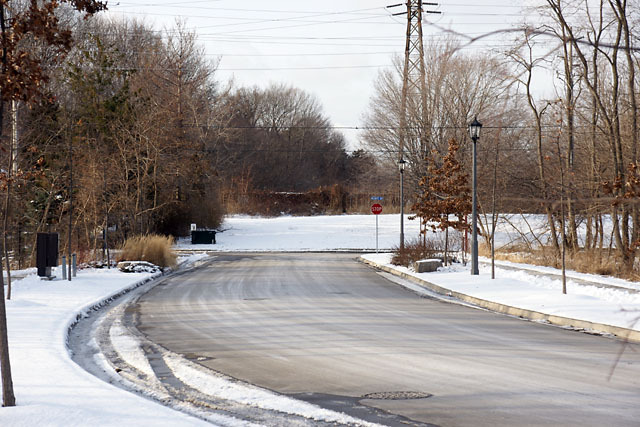 When it’s not covered by snow, you can still see old bits of asphalt where the road used to be. At the far end is a fence that restricts access to the CN tracks. Getting around this obstruction is the only detour required on the tour. Go down to Bayview, walk north under the tracks, and then climb the stairway up to the wide flat section where Pottery Road used to run. There was still a lot of evidence of the old road along here as recently as a couple of years ago, but the asphalt has mostly disappeared now. 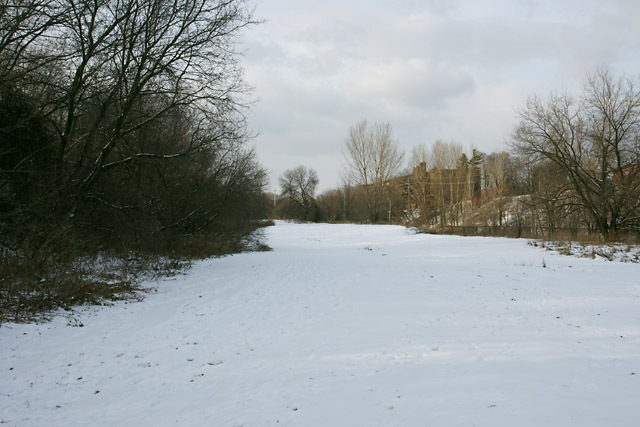 From here, you can continue walking north to see the final block of Pottery Road still existing today, a half-hour walk away from its beginnings on the other side of the Don Valley. Related: I’ve annotated a 1953 aerial photo of old Pottery Road from the Toronto Archives so that you can get your bearings. 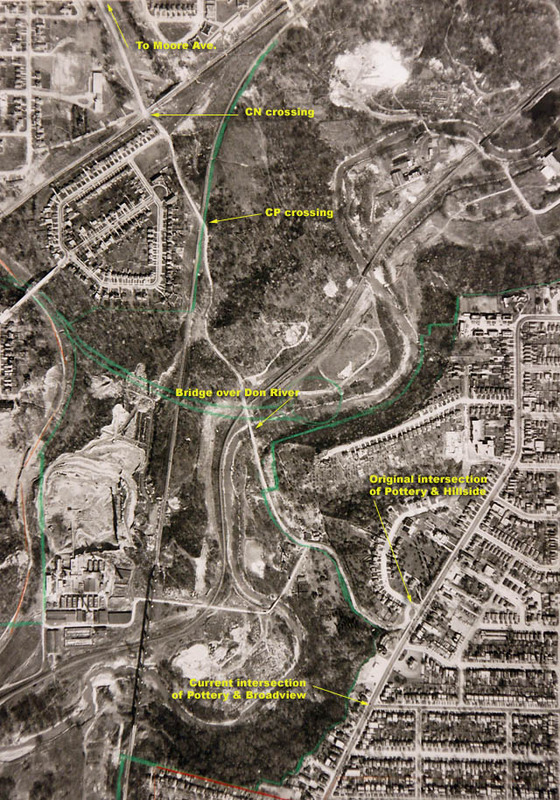 Pottery Road used to follow an even older route north of the CN tracks as seen in this 1947 aerial photo, turning west toward Bayview rather than proceeding north. Guess what? That alignment is still open too. I’ll leave it as an exercise for you to discover it for yourself. I started exploring OPR last summer. Your photos of the abandoned sections between Nesbitt and Bayview Extension are wonderful and should help me find it this summer(got lost last year). Please consider doing some new photos of this section — I’d love to know how it has changed since the late 90s. BTW, the narrow line of concrete near the now-defunct utility poles on the Bennington Heights section is disappearing into the brush. A footpath? Also, I’m confused about the where of the 1955 composite pic with the house and the “now” pic looking east toward the elementary school. Are they taken from the westward leg that’s now a footpath to Bayview Heights? The OPR pics that confuse me (last comment) are the composite Salmon? photos showing Cudmore house and the new one looking eastward to Bennington Heights PS. Was the berm the house stood on part of the one that rises immediately to the north of the old footpath/roadway/shoreline today? Interesting to see that the old roadway was in such good repair in 1955, when (I think) Pottery Road had already been rerouted northeast to Moore. Today, it seems there’s hardly room for a road on the narrow level allowance between the fall-off to the tracks and the berm or crest below park/schoolyard. I guess it was a very small road — not much traffic in what was probably a semi-rural area in those days.